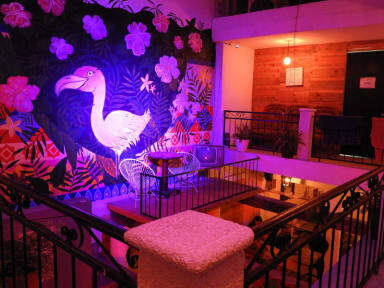 Macarena Hostel i Cancun, Mexico: Bestill nå! Walking you will find supermarkets,restaurants,bars in #rutanader, public transport and the bus station (ADO). The beach is only 15 minutes away from macarena hostel. During your stay you can meet and connect with people from every part around the world, sharing experiences and multicultural activities, which will leave a mark on your trip and life. Macarena is located in one of the most trendy areas in Cancun, with the best restaurants, bars and shopping places, Avenida Nader is becoming the best area for backpackers. Very close to beach area and bus central station, you will have an easy access to all the good places in Cancun. The maximum period of stay is 30 days.